Universal Pictures just released the scary trailer of director Jordan Peele's next film "US." A new nightmare from the mind of Academy Award Winner Jordan Peele, writer and director of "Get Out." 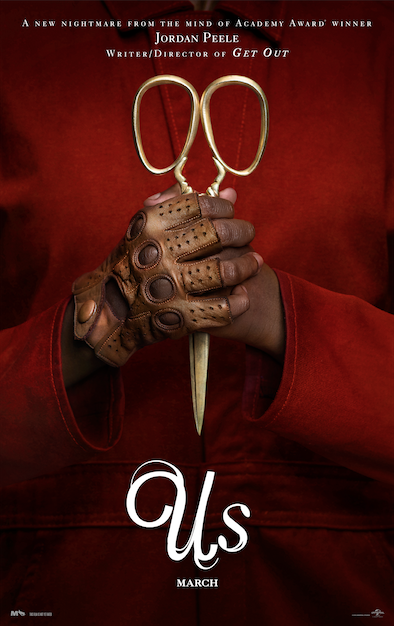 After sending shockwaves across contemporary culture and setting a new standard for provocative, socially-conscious horror films with his directorial debut "Get Out," Academy Award®-winning visionary Jordan Peele returns with another original nightmare that he has written, directed and produced. Set in present day along the iconic Northern California coastline, "Us," from Monkeypaw Productions, stars Oscar® winner Lupita Nyong’o as Adelaide Wilson, a woman returning to her beachside childhood home with her husband, Gabe (Black Panther’s Winston Duke) and their two children (Shahadi Wright Joseph, Evan Alex) for an idyllic summer getaway. When darkness falls, the Wilsons discover the silhouette of four figures holding hands as they stand in the driveway. "Us" pits an endearing American family against a terrifying and uncanny opponent: doppelgängers of themselves. Writer and director Peele produces for his Monkeypaw Productions alongside Sean McKittrick, Jason Blum, and Monkeypaw’s Ian Cooper. Us will be released by Universal Pictures on March 15, 2019.